A new book by Grian will go on sale in Spain in early July. 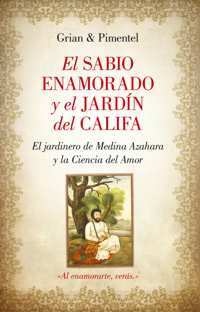 But this time is a co-authored book, because El sabio enamorado y el jardín del Califa (The Sage in Love and the Caliph's Garden) is a joint work of Grian and Manuel Pimentel, author, publisher and former Minister of Labour and Social Affairs of the Government of Spain. This new book builds on the Grian's novel Mahabbat to address again "The Science of Love", both in its human dimension and the spiritual and holistic one. In the most beautiful city in the known world, Medina Azahara, a timeless story lights the secrets of a heart in love. A novel to delve into the complex path of love through a bridge between the 10th and the 21st centuries. Latvian publishing house, Zvaigzne ABC, based in Riga, will publish this summer the bestseller of Grian. Wit this edition, The Gardener will reach the 10th language to be translated, thus entering an area of Europe that, until now, had no access, Eastern Europe and the Baltic. Zvaigzne ABC is the leading publisher in Latvia, publishing over 300 titles each year, and they have done a great job with the edition of The Gardener, providing an original format and a beautiful cover. After 18 years in the literary market, Grian's gadener continues reaching the soul of thousands of people around the world. "A new world must be made up of new persons, with other ways of being, thinking, feeling, doing...," the Eagle continued. "And that must be done day by day, minute by minute. You must be impeccable." Since the publication of The Gardener, in 1996, the deep but simple words of Grian have reached the heart of hundred of thousands of readers from all around the world. His short stories, his tales, and his essays have awakened the consciousness of thousands and thousands of people who keep his books at the bedside table as if they were life-handbooks or underline sentences and read its pages once and again trying to find among their ideas, images, and feelings something intangible that get them in touch with the deepest level of their souls. "Grian, like Gibran Khalil Gibran, like Tagore and, in some respects, like Antoine de Saint-Exupéry in The Little Prince, like some stories by Gabriela Mistral... unveils the infinite, the enormity of each unique, unrepeatable, and creative human being... He is a brave and moved storyteller, because he do not avoid to begin with himself, with his own physical and mental reality, with his environment, with his essential questions, with his answers..."
Author, psychologist, educator, translator, communicator, and social activist, Grian has brought his vision of a new and better world to every corner in the world. It is this vision of a new world that drove him to setting up a pacifist NGO, the Avalon Project - Initiative for a Culture of Peace, and that has led him to his academic research in the field of Social Education, trying to convey a systemic view of reality through spirituality of nature and myths, legends and folktales from cultures and traditions from all around the world.